These are also great ways to use up your stash, even the scraps! I'm going to challenge myself to use up as much DSP as I can before the end of the year, since I know there will be new "can't live without" DSP coming in January, and my storage space is limited! 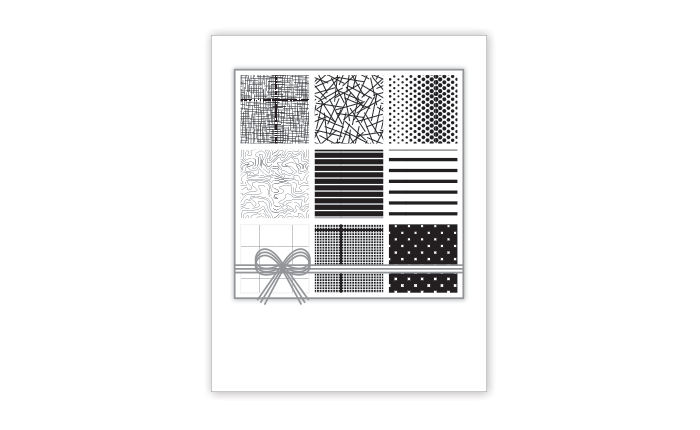 Labels: BTGO DSP sale, Designer Series Paper, DSP, Stampin' Up! My BFF sent me a stamp set that she had a duplicate of - gee, I can't imagine how that could happen! I mean, really, who could possibly forget that they had ordered something, and order it again? Oh yeah, that would be me. More times than I care to admit. So anyhoo, I was the lucky beneficiary of her forgetfulness and received this cute stamp set out of the blue one day. Can we say Happy Mail?! Since we just had out first frost last weekend, and I actually got to wear a sweater, I figured it was appropriate to bring out the comforting images of mittens, knit cap, and cable knit. 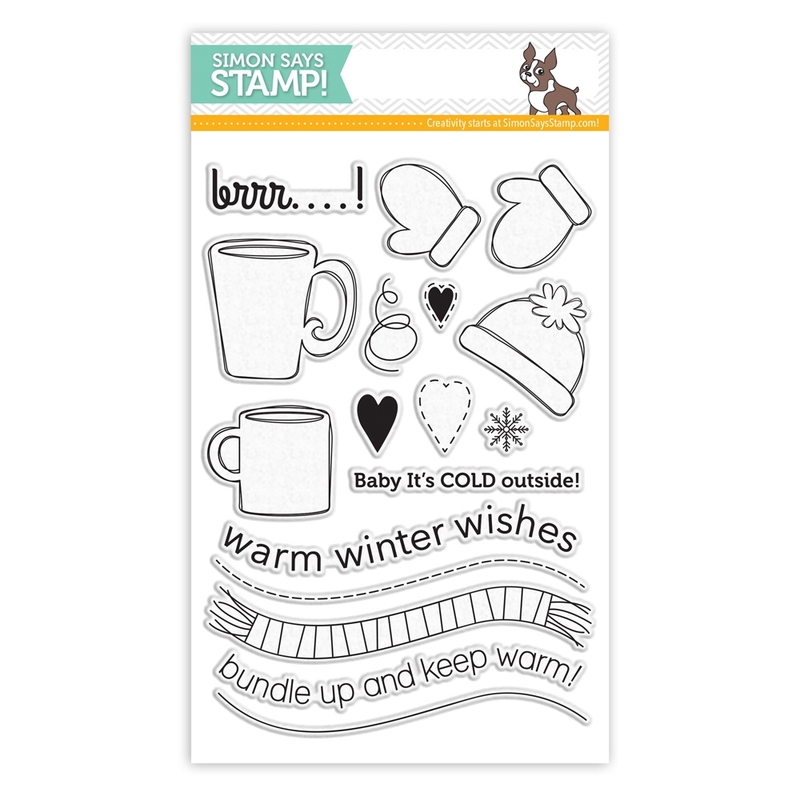 The images are from Simon Says Stamp Winter Warmth; the cable knit is Stampin' Up! Images: Very Vanilla 2" x 6"
Mat: Cherry Cobbler 2" x 8"
Greeting: Very Vanilla 1-1/2" x 4-1/8"
Embossed background: Very Vanilla 4-1/4" x 5-1/2"
Card base; Very Vanilla 5-1/2" x 8-1/2" scored and folded at 4-1/4"
Stamp mittens and cap (evenly spaced) on larger Very Vanilla strip using Basic Black ink. 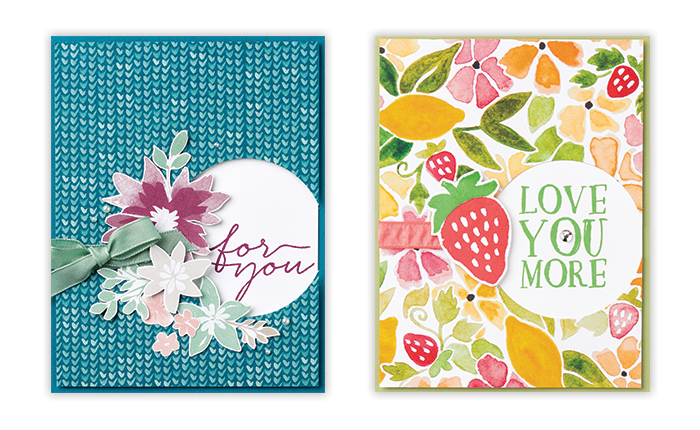 Color with Cherry Cobbler marker and punch out each image with 1-1/2" circle punch. Stamp hearts on mittens with Cherry Cobbler ink. Die cut four 1-5/8" circles from Cherry Cobbler strip. 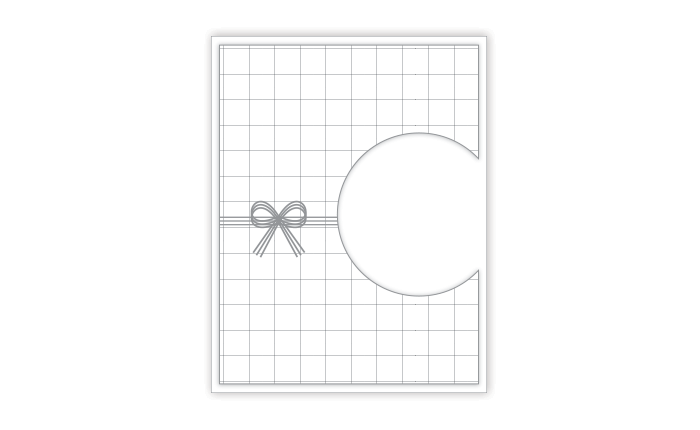 Adhere images to circles. Adhere snowflake to remaining circle. Note: I used a retired Snowflake Element; you can use a die cut or whatever works in that space. 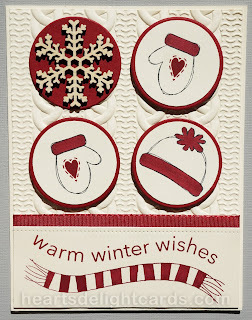 Stamp greeting and scarf on smaller Very Vanilla strip using Cherry Cobbler ink. Color scarf with marker. 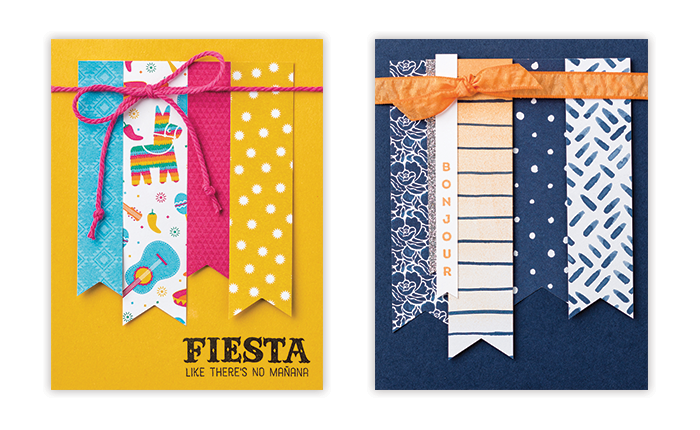 Note: I used an Avery Elle die for the pierced border. You can use a paper piercing tool if you don't have a die. Adhere Cherry Cobbler ribbon under upper edge of greeting panel, leaving ends to wrap around embossed panel. 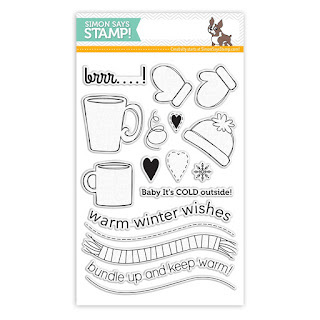 Emboss Very Vanilla with Cable Knit folder, then trim down to 4-1/8" x 5-3/8". 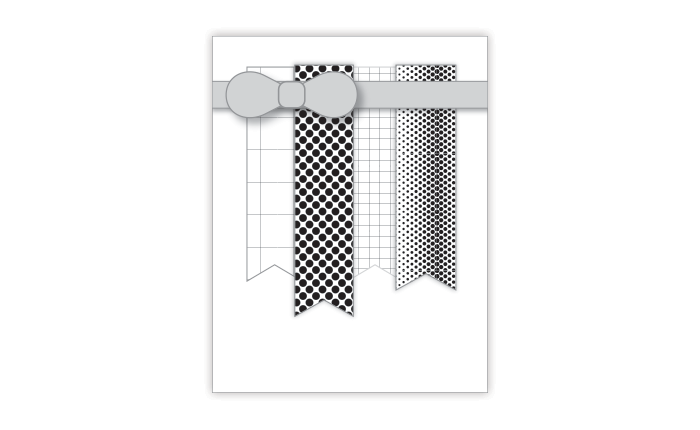 Adhere greeting to bottom, wrap ends of ribbon to back and adhere. 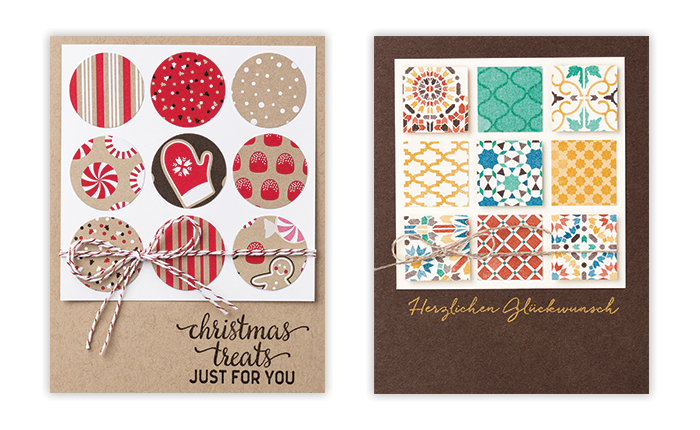 Attach images with dimensionals, and snowflake with liquid glue (it already sticks up, so don't use dimensionals! ).